Alice M Bowman was one of the Rabaul Nurses held in captivity for more than three and a half years. At the very beginning of the Pacific theatre of the Second World War (WW2) Rabaul fell to a swift, destructive Japanese invasion which left little or no chance of escape for many courageous men and women. 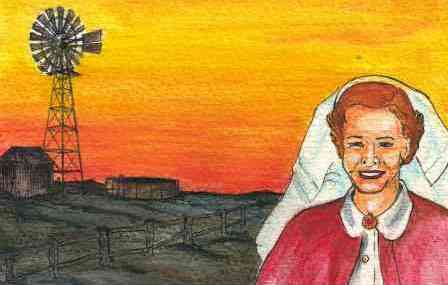 In Not Now Tomorrow Alice M Bowman tells the nurses' compelling story of imprisonment in the name of one's country and of strength in adversity. and boasts the most beautiful harbour in the islands. The story begins in the late thirties when Alice M Bowman was posted to the Department of Health in Rabaul. At that time Rabaul was the administrative centre of the Australian Mandated Territory of New Guinea; also at that time, Rabaul was peaceful and secure. In far away Japan, in the late thirties, militarist extremists were planning the strategy of the Pacific War. On the 7th December 1941 (8th December Australian time) Japan launched attacks in Malaya and Thailand, coinciding that same day with the massive, surprise attack on Pearl Harbour. America immediately declared war on Japan followed without delay by Australia and the United Kingdom. Evacuation of all women and children from New Guinea was compulsory, although the Administration and Missionary nurses were allowed to remain if they wished. Honouring their profession, Bowie (as Alice M Bowman preferred to be known) and her six colleagues from Namanula Hospital elected to stay; abandoning their duty in light of the task ahead was not an option. Four Methodist Missionary nurses also chose to remain. Territories in the South-West Pacific Area fell to the Japanese in unprecedented, quick succession. After Hong Kong on Christmas Day 1941, Rabaul was next to fall on the 23rd January 1942. On the 15th February the impregnable fortress of Singapore, so heavily fortified, surrendered to the Japanese — a shattering blow to Australia. The devastating defeat three weeks previous of the all-Australian garrison at Rabaul passed almost without notice. A place of honour in history was hard won by a token force of Australian units entrusted with the defence of Australian protected soil. Their encounter at Rabaul, against the then invincible Japanese, was the first in the New Guinea campaign. On 12th December 1941, when an imminent Japanese invasion was apparent, it had been decreed in Australia that no strengthening support of the battalion would be forthcoming; all the fine young men of this small garrison were to be regarded as hostages to fortune. It is not hard to imagine thoughts in the minds of the inadequately equipped, fifteen hundred strong Battalion and the hundred or so New Guinea Volunteer Riflemen on facing the many barge landings of thousands of Japanese from a huge naval flotilla. America was busy establishing bases further east in the Pacific at this time and could not be called on for support at Rabaul in the event of an invasion. The Rabaul Nurses were captured and interned, along with most of the civilian men of Rabaul (who were never offered evacuation) and the greater part of the 2/22nd Battalion, Lark Force, and many support members of the garrison who could not escape. Eleven civilian nurses and their six Australian Army Nursing Service colleagues — known collectively as the Rabaul Nurses — were held in captivity at the Vunapope Sacred Heart Catholic Mission. 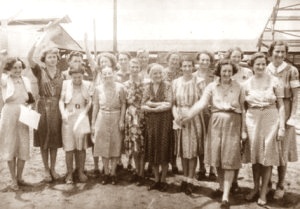 The Australian army nurses were stationed at Rabaul as part of the 2/10th Field Ambulance detachment and were included among those destined to be abandoned by the Australian government as hostages to fortune. The Rabaul Nurses' number increased to eighteen with the capture of Mrs Bignell, not a nurse by profession, but a Red Cross worker who had remained on her plantation on the outskirts of Rabaul. Vunapope Sacred Heart Catholic Mission became an internment camp for all at the mission. The missionaries were men and women of many nationalities mostly from Europe where the Sacred Heart movement was founded. Strengthening their number were several Australian nuns and two Australian priests, interned in Rabaul. Their saga under Japanese occupation and the Mission's three and a half years internment is an incredible, heartfelt story touched on briefly in Not Now Tomorrow. At the end of almost six months at the Mission, just after Bowie's 30th birthday, the Rabaul Nurses were transported to Japan along with the officers of Lark Force aboard the Naruto Maru, an unmarked Japanese merchant ship. It is thought that the Australian Catholic nuns were to be sent with the nurses and that only strong intervention and delicate persuasion by the Bishop of Rabaul prevented this! Conditions were imposed and the nuns' vital work at the mission was allowed to continue with the Bishop's assurance of their loyalty. The Bishop, Leo Scharmach, was Polish by birth and as a very young man had fought with the German Army in the First World War; he was regarded as German by the Japanese. He came to Rabaul in 1925 and his appointment to Bishop of the Diocese in 1939 proved a wise, if not a somewhat political decision. The Bishop's influence with his captors, however, could not extend to rendering him the saviour of the Australian Catholic priests. These two missionaries met their fate with the enlisted men of the Australian garrison, those would-be hostages to fortune, and the captured civilians of Rabaul whose numbers included several members of the Methodist and Seventh Day Adventist Missions. With the sinking of their Japanese prison ship Montevideo Maru enroute to Japan, all these prisoners, who were purported to be on board, perished. In April 1942, all prisoners in Rabaul were requested to write one letter home. A substantial number of these letters reached their destination which gave credence in Australia to the abiding belief throughout the war that all captives, including the nurses, were being held in or near Rabaul! In Japan, the nurses were kept in isolation with no communication by mail permitted; letters posted to them were never received. No information regarding transportation of Rabaul prisoners-of-war was conveyed to Australian Authorities. On arrival in Japan their number increased to nineteen when Mrs. Etta Jones was placed with them. Mrs. Jones was an American, captured with her husband when the Japanese invaded the Aleutian Islands. Hope for the Rabaul Nurses, that they were not entirely lost and forgotten, was revitalised at Christmas with the receipt of parcels from the International Red Cross. Courage to endure was never abandoned throughout their ordeal of constant stress and indignity in a foreign land; the wretchedness of starvation was further aggravated by the tortuous cold of northern hemisphere winters. Their undeniable faith rested in tomorrow, when they would be free. The Australian women from New Guinea who wore "the cape of red" were a unique group in a unique situation in Japan. 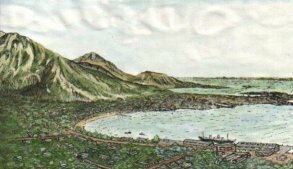 They were held for two years at Yokohama (near Tokyo) before being sent further south to a small, abandoned Tuberculosis Hospital in the country at Totsuka. Bowie's perceptive account into the life of the peasants in the near-by village and the nurses' interaction with them — for their own survival — gives unusual insight into life in wartime, rural Japan. Not Now Tomorrow presents a first hand glimpse of how the Second World War crept upon Rabaul; how the Rabaul Nurses fared in captivity in the Japanese homeland and how, not far from Tokyo, the last dramatic stages of the war were viewed. Finally their faith in tomorrow — Victory for the Allies — found them free at last. ...a wonderful true story, woven out of lost time. Beautifully written and researched. As one of the Rabaul Nurses I cried and laughed with sheer delight when I read it. character with Sr. Berenice Twohill in the Australian telemovie Sisters of War. ...a good read and a valuable war history. ...magnificent, once you pick it up you will not put it down. ...It is a great and informative story which will be read with great interest, particularly by anyone concerned with the grim period she writes about. C O (Bill) Harry, 2/22nd Battalion "Lark Force" Association. ...graphically portrays the dogged spirit of Anzac. ...valuable addition to any High School library. Not Now Tomorrow one of six books credited in the "And Also" page.